This is a rural Devon, River Cottage version of the classic Italian sauce. 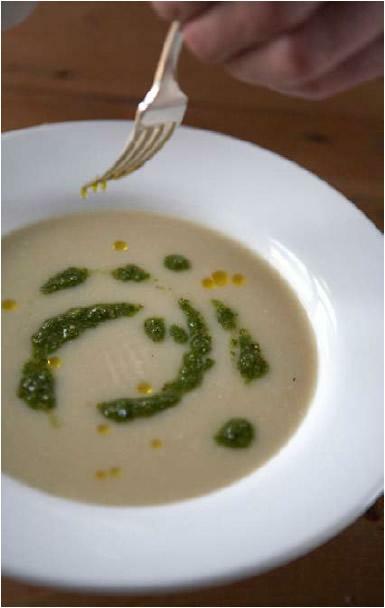 We substitute nettles, rapeseed oil, Cheddar and breadcrumbs for basil, olive oil, Parmesan and pine nuts. Use it wherever you would use pesto it is excellent swirled on top of creamy soups, or tossed through pasta. Preheat the oven to 180°C/Gas Mark 4. Scatter the breadcrumbs on a baking tray and bake for about 10 minutes until dry and golden, checking them frequently towards the end as they burn quite quickly.Tip on to a plate and allow to cool. Wearing gloves, pick over the nettles, discarding all but the thinnest stalks, then wash well. Fill a bowl with iced water. Find a pan large enough to take the nettles and half-fill it with water. Bring to the boil and cram in the nettles, pushing them down with a wooden spoon to immerse them. Cook for just 1 minute, then drain through a sieve over a bowl to save the cooking water. Immediately plunge the nettles into the iced water. As soon as they are cold, remove and squeeze them as dry as you can – they will not sting you once they are cooked. Season your pesto with salt and pepper to taste. It is now ready to use. As for the nettle cooking water you saved, drink it – it's too good to waste.